That would be me. I keep thinking I'm going to have time to post something here, and I just don't make the time. Anyway, I found some more pictures, and I thought I'd share. This is the elusive purple sweater I keep talking about. 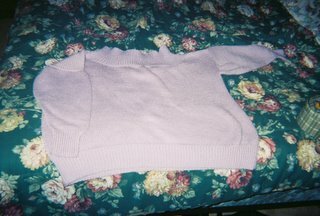 I don't know how much you can tell from the picture, but it was the Soft Focus pattern from Big Knits, whose co-author Dawn French is one of my favorite British actresses. This afghan is crocheted, and it's a pattern that apparently Coats and Clark don't print anymore. It went out of print almost as fast as it was in print. 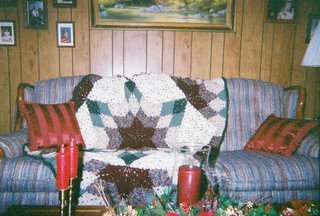 My mother-in-law picked the pattern for me, and I made this afghan for my mom's parents for Christmas last year (2005). As for the podcasts, I have downloaded several. The ones currently on my iPod are About Time, KnitCast, Cast On, Knitting News Cast, For the Love of Fiber, KnitWit, Musings of a peaceful knitter, Pointy Sticks, Secret Knitting, and the Mosh Knit. I know, it sounds like a lot, and I guess maybe it is. I've only really listened to KnitCast, because I just found all the others.